College football took up 6 of the top 7 slots on Saturday cable, with more farther down the list, ranging from 0.12 for a late ESPN2 game to 1.80 for the mother network’s primetime coverage. (The game’s streak was interrupted by a 10:30AM airing of SANJAY & CRAIG on Nickelodeon, which drew 0.53.) 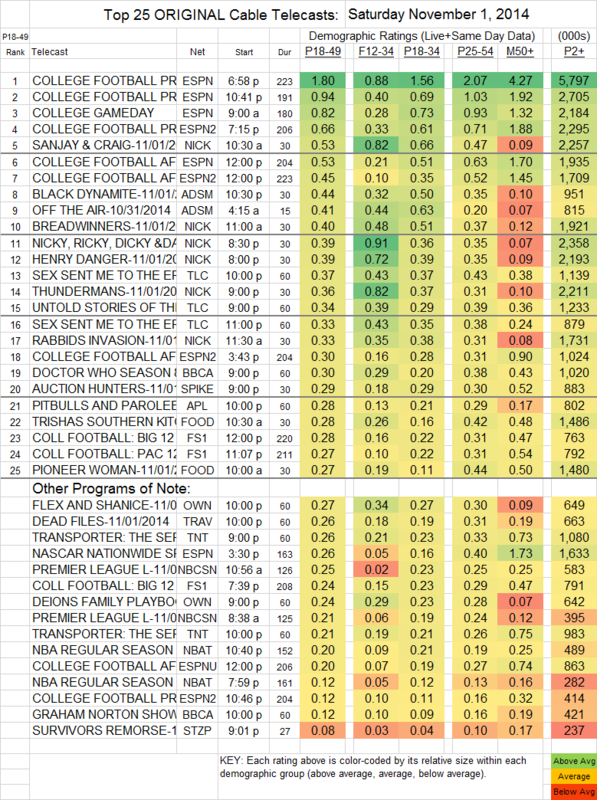 BLACK DYNAMITE (Adult Swim) led the way for adult scripted programming, down 0.06 to 0.44. DOCTOR WHO (BBCAmerica) dropped 0.08 to 0.30. THE TRANSPORTER (TNT) remained essentially steady, at 0.26/0.21 compared to last week’s 0.23/0.23. SURVIVOR’S REMORSE (Starz) was also steady at its low 0.08, and THE CHAIR, for what it’s worth, also held even at 0.02/34K total viewers. In response to viewer queries: THE KITCHEN (Food) was at 0.25/1.34M at 11AM, and NBC Sports Network’s MLS coverage was at 0.08/205K. Those who’ve been following the INFOMERCIAL ratings on Adult Swim will be excited to know that its new masterpiece, OFF THE AIR, was the 9th highest-rated original show on Saturday cable, at 0.41 with 815K total viewers. Brilliant programming!